Where I live, I have at least 4 street lights visible from my two observing spots; both LED and Sodium Vapor. 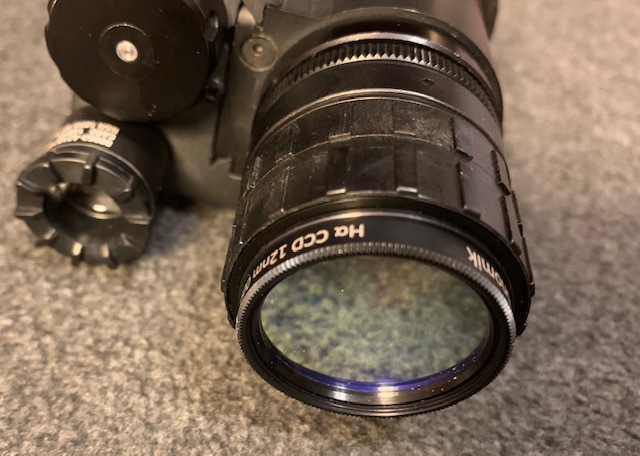 When using the 1x Envis on my Mod 3C, I always held my free hand close to the Envis lens to block stray light that would hit the lens and cause glare. So I decided to make a shield to extend in front of the lens. I used bathroom sink drain tubing that is chromed brass. The outside diameter is 1-1/2"... the inside is slightly over 1-7/16". In any event, it must fit over the Envis lens. The tube I used is a PERFECT fit over the Envis lens, with enough friction to keep it securely in place. I started out making it 2.25" long and then shortened it in 1/8" increments until vignetting disappeared from the FoV. The final length became 1-3/4" which allows for 7/16" of shielding beyond the lens. I tried painting the inside with flat black, but glare was still present, so I cut a 3/8" wide strip of sticky back felt and put it on the inside of the tube... it really did the trick. I've used it 3 nights now, and find it to be pretty effective. It allows me to scan the sky within about 5° of the sodium vapor lights (and the moon) or, within 10° of the LED lights without excessive glare on the lens. If you live around lots of streetlights, this is a pretty effective and inexpensive aid. Now, I can use my free hand to shield the ocular and my eye from all those streetlights! Great idea! I don’t have any direct street lights in my observing area, but a lot of neighboring high mounted porch lights. 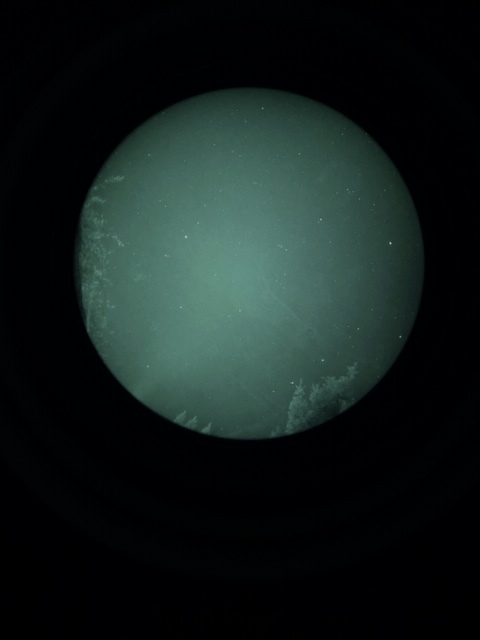 To show the effect of the shield, here are four images; the first is with a sodium vapor light just off of the FoV at about 7 o'clock without the shield. Sorry about the vignetting in the last two photos... I hit the phone and it moved in its bracket on the NVD, so about 3/4 of the image is vignetted. But it's too cold to bother doing it again and I just got warmed up! You can see that the little shield is fairly effective at blocking bright glare, even when the FoV is very close to the light source. The felt in the end of the tube definitely helps. It's cheap enough to make. You just have to find the right size tubing; black ABS would be easier to make if there is a tube with the correct inside diameter. A very good idea.. I may have to look into 3D printing a good lens shade. Can you design it like a cone or with a bigger diameter (like camera lens shades) that extends beyond the Envis lens? A bigger diameter would allow for a longer shade that might be even more effective. That's slick! Will probably have to make my own version sooner rather than later. 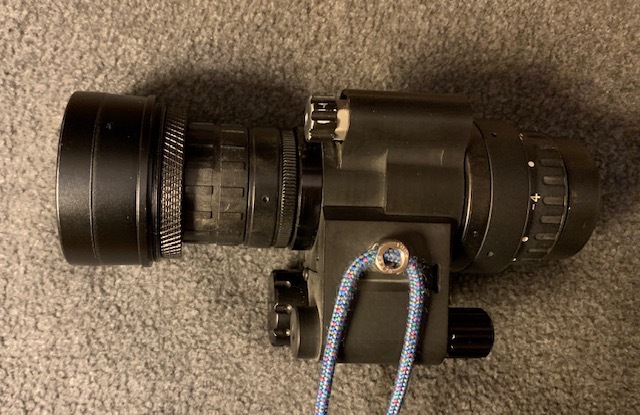 Anyone have or seen a 3x magnifier with trashed optics? Removing the glass and using the housing as a shade could be right about ideal. Edited by 11769, 12 February 2019 - 10:47 PM. Wondering if the opening is just big enough to slide over the envis lens. Maybe I’ll order one and try to adapt it. It protrudes about the same length as GeezerGazer’s version. Probably much cheaper and easier to get the bathroom sink drain tubing specified. It’s a perfect fit already. I just ordered a screw-on camera lens hood with a 49mm male threads for $6.95 shipped on the Bay. Then I ordered a step up adapter ring from 42mm (same at TT or T2) to 49mm, $2.85 shipped. These will fit a RAF Camera adapter (already in my possession) that screws onto the front of the Envis (30.3mm x .8mm threads) with female 42mm threads... ready to receive the lens hood with adapter. 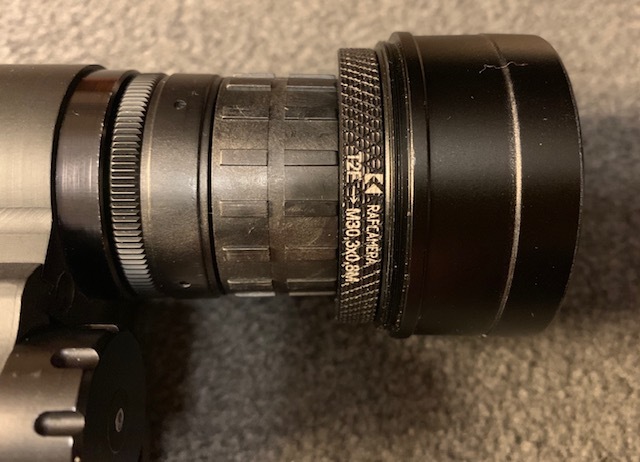 I originally purchased this RAF Camera adapter so that I could use the Envis lens with 2" H-a or long pass filters (by adding a 42mm to 48mm step up adapter ring). So now it will serve a dual purpose. Of course, I must wait until the boat from China arrives. But I think it will be a very effective solution... better than my sink drain tail pipe! For only $10, I can wait. In the mean time, I'll use the drain pipe and consider it a "proof of concept!" The outside of the Envis on my Mod 3C is 36.8mm. The closest camera lens hood I could find had a 39mm inside diameter. There might be a 35m but either way, sliding it on the outside of the lens will be a problem to solve. BUT, thinking about this lens hood a little more, I remembered that I have an extra Baader T2 2" nose that I originally used on my T2 diagonal. 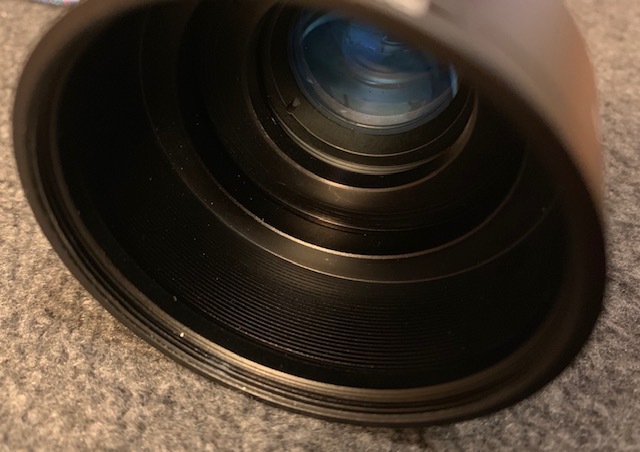 The inside of that nose is really well baffled and since it is 42mm threads, I screwed it onto the RAF Camera adapter I spoke of in the above post. It's a very clean and compact solution. The RAF Camera adapter was about $25. A 2" nose with 42mm threads is just a few bucks if you shop the Bay. This Baader nose is fairly short and I think will clear the 40° FoV without vignetting. 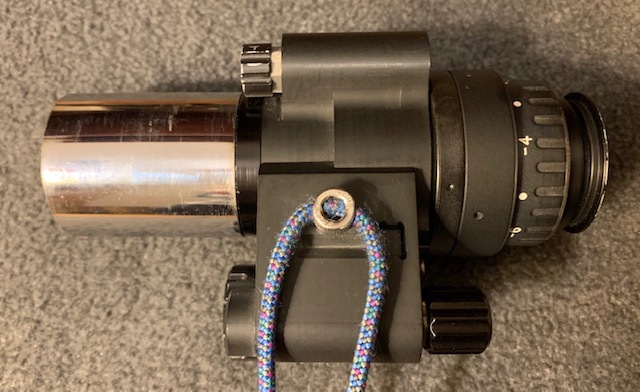 The advantage of this solution is that using the T2 Nose, it's already threaded for 2" filters, so if you have them, this would provide an easy way to use them with the Envis lens. So here's what it would look like. It's raining here today, tomorrow, and until next Tuesday. So I'll try it and report back... in time. Edited by GeezerGazer, 14 February 2019 - 12:29 AM. Here's a photo of the 2" nose with a 2" filter attached to the Envis lens. Very strong connection that won't fall off in the dark and provides for filtration too. It stopped raining for a while, so I took the Mod 3C out with the Baader 2" nose attached and moved it slowly closer to the agonizingly bright LED street light just 50' away. No glare at all until I was within about 2° of the light. 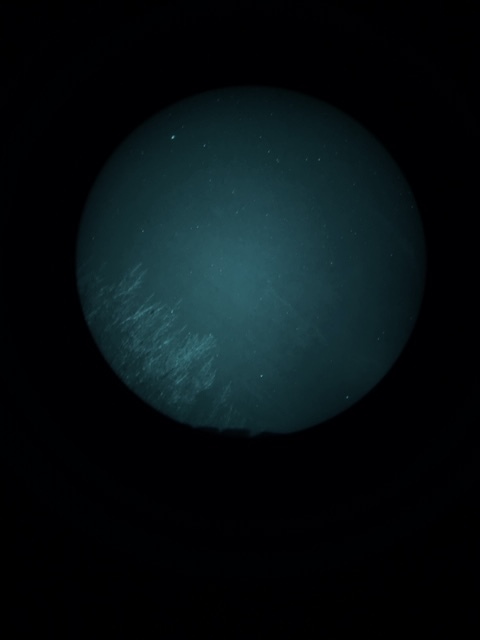 When I tried it on the Sodium Vapor, I saw no glare at all, until the light was visible at the edge of the FoV. This is definitely better than the original drain tailpipe which showed glare when I was about 2-3° from the sodium vapor light and about 5° from the LED. I would guess that the moon, which responded like the sodium vapor light last night using the tailpipe shield, would cause no issue concerning glare. I could make a diagram to find out if vignetting should be present, but it's easier to just take a photo or two. When vignetting is very mild, it's difficult to detect visually. But photos generally show it readily. 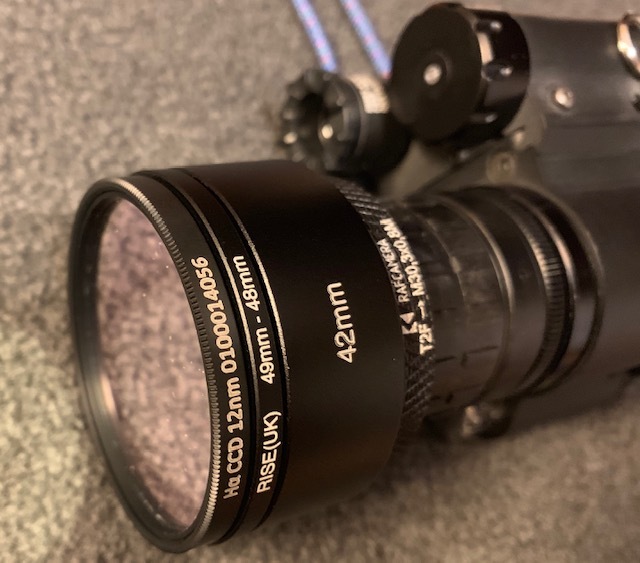 I know the diameter and length of the Baader nose with the RAF adapter is close to the point of possibly causing vignetting, but I won't be able to test it with photos until we have some dry weather which isn't in the forecast until next Tuesday. I have a T2 2” nosepiece. Yes, the RAF Camera adapter for the Envis to M42 is SKU 0711332405042 called a "T2 to M30.3 x 0.8 Adapter" for $24.95. The T2 nose you select is better if it is well baffled inside. I think the baffling really helps. I still need to check on the vignetting issue though... to make sure the size of the nose is neither too long nor too small of diameter to allow a full 40° FoV without vignetting. If it does vignette, it will be mild, which may not be noticeable visually anyway. When we have a break in the rain, I'll try to take a couple more images. 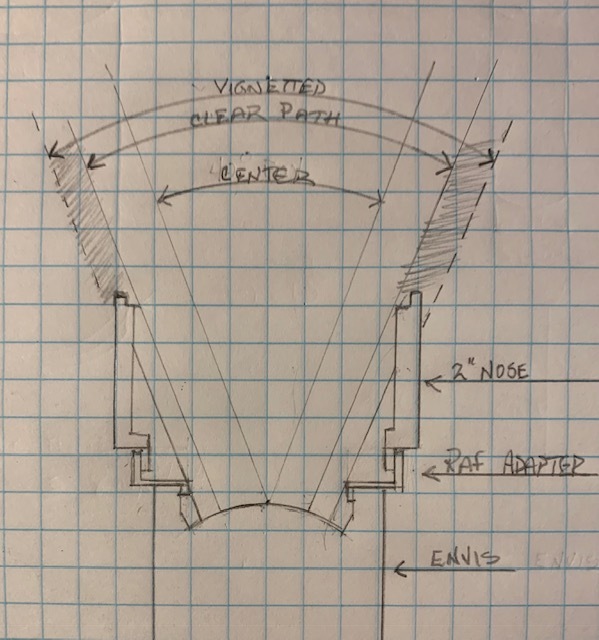 I did a diagram for the 2" nose to see if or how much it vignettes... and it does. To prevent vignetting caused by the T2 nose, the diameter needs to be increased or the length needs to be decreased. But the good news is that the amount of vignetting is probably what I would characterize as mild to moderate and will play little if any role in visual use. In the diagram I drew, the area where vignetting occurs is in the darkened area between the two outer FoV lines on each side of the arc. 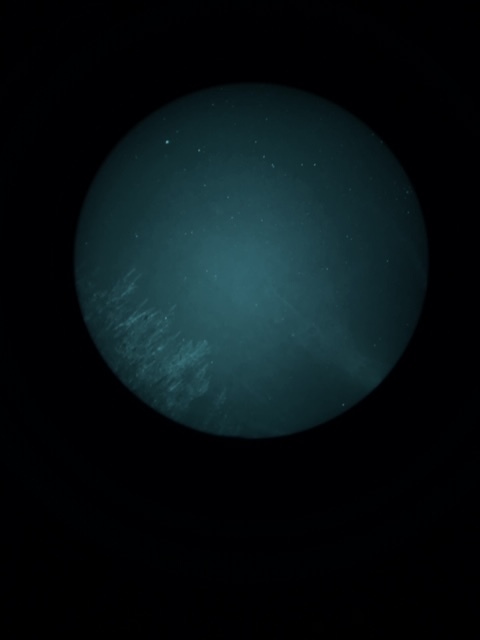 Actually, the RAF adapter intrudes on the the FoV just a tiny bit, not enough to be seen, even in photos. The addition of a filter will introduce a little more vignetting because of the thickness/width of the filter cell. My thought is that if it is to be used strictly visually, as intended, then it should be fine... and will be a big help for those of us who are surrounded by bright lights. But even if wanting to avoid glare from Luna, this measure of blocking stray light from hitting the Envis will be of help. Last summer I needed a part from RAF and figured since I had to pay the shipping, might as well do a search for "envis" and order one of everything they had. When I ordered the 49mm screw-on camera lens hood, I also order a M42 to M49 adapter ring. Then I found a 42mm screw-on lens hood and ordered it too. They all arrived in the last few days and they all fit perfectly. Here are some photos of them, together with the Baader T2 to 2" nose adapter. By comparison, both the 49mm and 42mm lens hoods are shorter. They have nice micro baffling inside, although I might paint them flat black inside (like the Baader 2"-T2 nose). The 49mm lens hood is a little longer but bigger diameter. It's still raining here, so can't test 'em right now, but I think either one will help if you are surrounded by street lights or residential floodlights. Neither of these camera lens hoods should cause any vignetting. 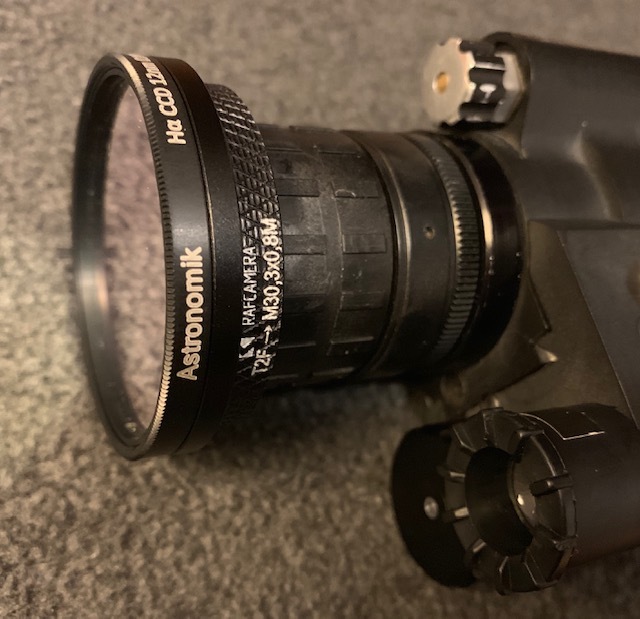 The 49mm lens hood does require a M42 to M49 step up ring ($2.95 on the Bay) and it presents a little more depth with 7mm more diameter which should not vignette. Since I previously posted how the Baader T2 2" nose looks, I'll include in photos below to show comparison of these three options. I really like the compact nature of the 42mm lens hood, but I'll have to wait until I can test it for vignetting. I think it will pass muster because it is about 1/8" shorter and has a bigger inside diameter than the Baader 2" nose. 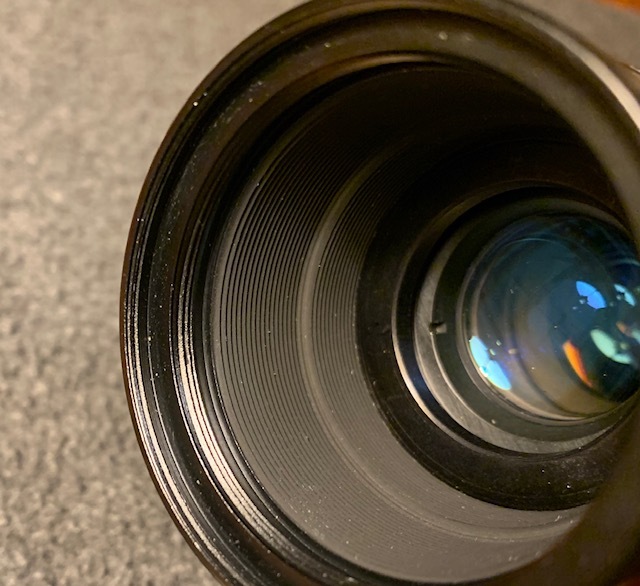 I've already ordered a step up adapter ring ($3) to attach a 2" filter to the front of this lens hood in case I ever want to use it in that fashion. If you only observe from a dark site or from a light polluted site where there are no direct lights to contend with, then you probably can skip this accessory. 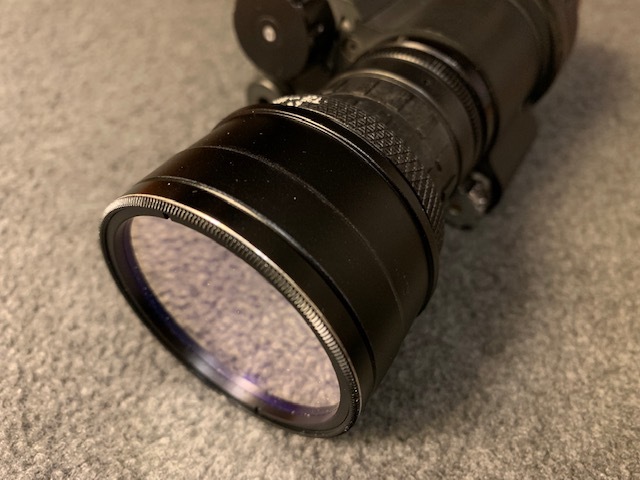 But if you have direct street lights or residential flood lights at your observing site or home, then you may want to consider purchasing one of these to eliminate glare on the Envis lens. Here are some images for consideration. I'll test for vignetting and streetlight glare control as soon as I have some time. 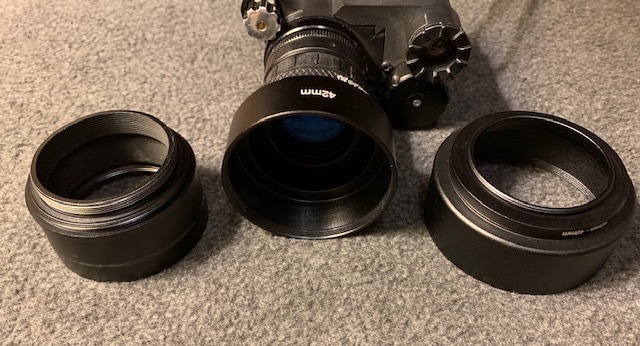 Both of these camera lens hoods are threaded to accept filters, but to use a 2" filter for use with them will require either a step up ring for the 42mm hood or a step down ring for the 49mm. 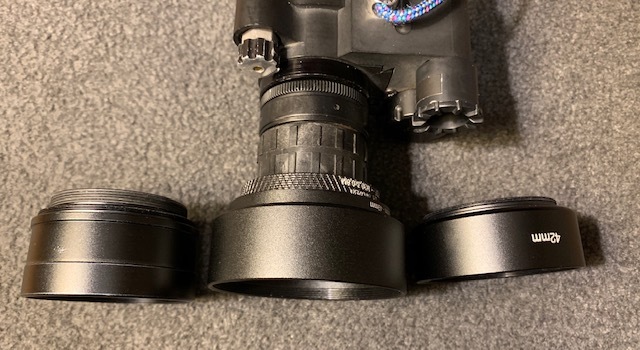 And this image shows the M49 camera lens hood attached to the NVD with the Baader T2-2" nose on the left and the 42mm lens hood on the right. Edited by GeezerGazer, 05 March 2019 - 12:24 AM. So from home, I am still using the light shield I made from a plumbing tailpipe... 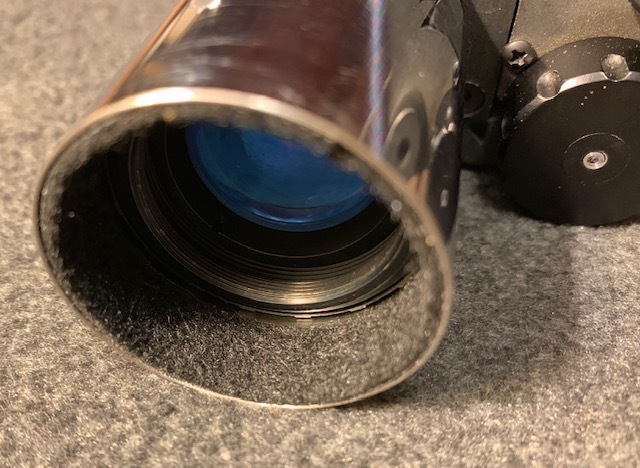 I appreciate being able to use a 1.25" IR or H-a filter with the shield to greatly reduce glare on the lens and filter from direct light sources in my neighborhood. When I go to my dark site (green zone) there are no visible light sources in close proximity, so I don't need a light shield at all. 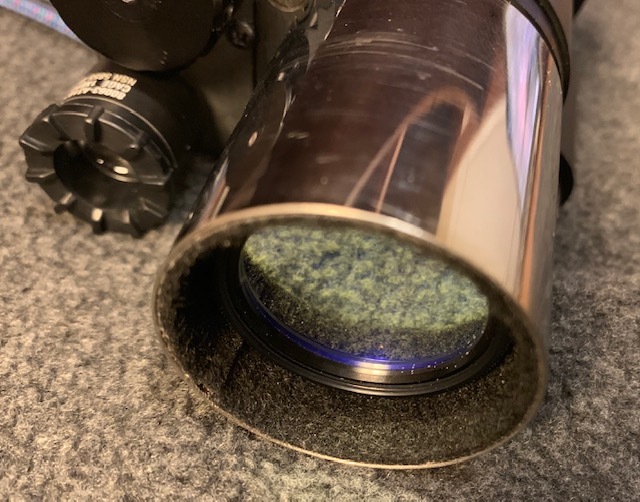 If you have direct, annoying light sources at your observing site, but you do not use IR or H-a filters, then the 42mm camera lens hood would be a good choice. 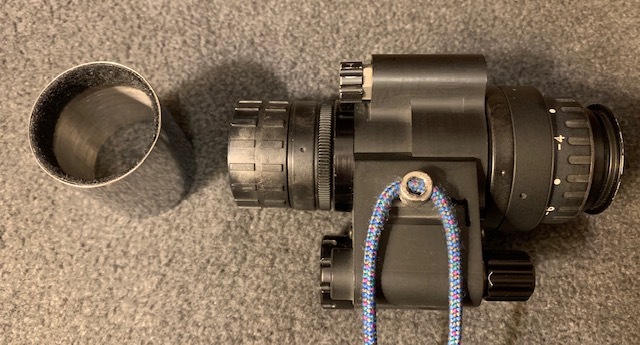 If you want to use filters with your shield, make one that slides over the Envis lens so filters can be attached directly to the Envis threads (using the tiny RAF adapter ring).